Annie Woods's Blog: The Angelheart Saga Blog - Posts Tagged "giveaway"
Enter Tea With Rose's Tomes's wonderful giveaway containing First Came Forever in paperback, five bookmarks and mystery character design stickers of this book made by Rose! Also, do not miss to check out the gorgeous blog where Rose shares not only her love for books with you, but also a playlist that flows with the book and right down to the type of tea to drink to heighten the experience at Tea With Rose's Tomes. Don't miss this awesome GIVEAWAY by Danielle, The Introverted Book Nerd, to win a paperback copy of First Came Forever! Along with winning a book you will also receive 5 bookmarks that go along with the novel. The giveaway starts 8/9 and ends 8/10. Must retweet and follow both Danielle and Annie on Twitter. To gain an extra entry, must follow The Intoverted Book Nerd blog AND comment your Twitter handle below. The giveaway is open internationally until October 8, 2017 at midnight EST. The giveaway ends this Thursday, September 14th, so hurry to enter! Also, you must not miss to check out the wonderful Darque Dreamer Reads blog! Tea With Rose's Tomes's is making a wonderful giveaway containing First Came Forever in paperback, five bookmarks and mystery character design stickers of this book made by Rose! The giveaway ends this Sunday, October 1st, so hurry to enter! To celebrate her birthday and 600+ followers, Darque Dreamer Reads gives away a paperback copy of First Came Forever, a Pages Remembered Book Sleeve, a Ribonita Chocolat Bookmark and a BOOK OF YOUR OWN CHOICE from The Book Despository! This is such an amazing and generous giveaway, you really cannot miss it – head over to the Darque Dreamer Reads blog and enter! Giveaway Details: From now, until the 11:59 p.m. on Halloween. Enter the lovely giveaway by Thebooknookae of First Came Forever. To celebrate her 1k bookstagram followers, Thebooknookae throws an amazing international giveaway. Along with winning a paperback copy of First Came Forever you will also receive three kinds of bookmarks that go along with the novel and a love potion candle made by Thecraftstudioae. This giveaway ends 22nd October and winners will be announced on 25th October. Also, do not miss to check out the gorgeous blog Thebooknookae where Ramsha shares her love for books and Thecraftstudioae with the wonderful handcrafted bookmarks and candles. Lovely Samama Reads is hosting a gorgeous giveaway of a paperback copy of First Came Forever and a lot of other cute goodies. Deadline is November 10, so head over to her bookstagram @samama.reads right away to enter! Also, do not miss to check out the gorgeous blog Samama Reads where Samama shares her love for books. To celebrate Thanksgiving and for reaching 500 followers on my Instagram I wanted to show my appreciation by giving away a signed paperback copy of my book First Came Forever. This giveaway is international and open to all lovely bookworms! 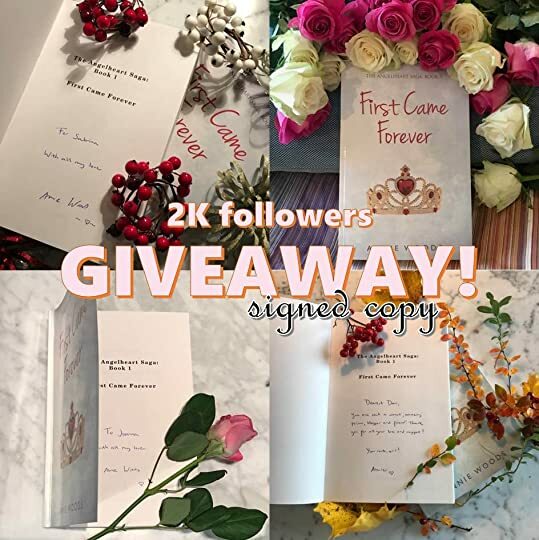 The wonderful book blog Darque Dreamer Reads is hosting a Valentine's Day Giveaway of a paperback copy of First Came Forever. The giveaway is international and runs until February 13th. Head over to Darque Dreamer Reads's bookstagram account (@darquedreamer) or Twitter (@DarqueDreamer) or click here for instructions how to enter! To celebrate this and show my appreciation I am giving away a signed paperback copy of First Came Forever.